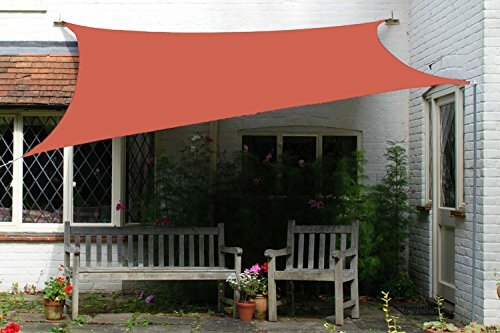 Artouch 10' x 13' Terra Sun Shade Sail offers professional sun shade solutions for gardens, patios, swimming pools, bbq areas etc. Artouch knows deeply that our customers can't have great time with their loving family due to hot weather and harmful sun rays when exposed under blazing sun especially in summer seasons. Based on what our customers suffer, Artouch constantly design and improve specifications and performance of sun shade sail to better meet our customers' demands. Warranty: 5 years quality warranty. Artouch sun shade sail is very easy to be installed. According to different actual conditions, there are various installation options. The easiest way is to connect stainless steel ring on each edge and fixed objects like trees, patio columns, wood posts or stainless steel posts(embedded in concrete footings) etc. Warm tips: the digital images we display have the most accurate color possible. However, due to differences in computer monitors, it may exist very little color differences between the actual product and your screen, which is hard to be avoided. Material: the sun shade sail is made of 185 gsm UV protected high density polyethylene (100%HDPE) shade fabric with strong stitched seam. UV BLOCKAGE: 90% high density breathable blockage, while effectively reducing heat, block up to 95% of UV rays, shade sails also allows water and air to go through freely. In order to protect the skin. 5-year warranty under normal usage and special weather conditions, such as winter.Easy to clean with mild detergent and water. The sun sails fade resistant, and is free of mild, mildew and stains. Widely used for a patio, lawn, garden, pool, bbq areas,pond, deck, kailyard, courtyard, backyareaard, dooryard, park, carport, pergola, sandbox, driveway or other outdoor to provide 80%-85% sunshade and protect against 88% up to 95% harmful UV rays, and make your patio privacy safe, cool and fabulous. If you have any questions about this product by Artouch, contact us by completing and submitting the form below. If you are looking for a specif part number, please include it with your message.